A Beverage, is a kind of liquid which is specifically prepared for human consumption. A hot drink is any beverage which is normally served heated, by the addition of a heated liquid, such as water or milk, or by directly heating the drink itself. 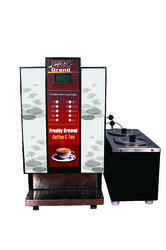 Our 9 option beverage vending machine gives you tea, coffee, milk, black coffee, strong coffee, black tea, light coffee, light tea, strong tea etc.